Following up the remarkable year of 2010 was always going to be a challenge, and I am pleased to report that the bee itself has undergone further extension of range and a massive amount of "infilling". That we are able to record this expansion has been due to the superb efforts of our many recorders from across the country. In all we received some 1630 records during the season which showed further consolidation in known areas, with many repeat observations. The total number of occupied grid cells now stands at 673 (an increase of 337 over the end of year total for 2010) and this is derived from 1632 individual records. Added of that, we have seen considerable expansion across Wales, reaching Aberystwyth by mid-June, a mass of records from the Newcastle area, along with many from Lancashire and Cheshire. 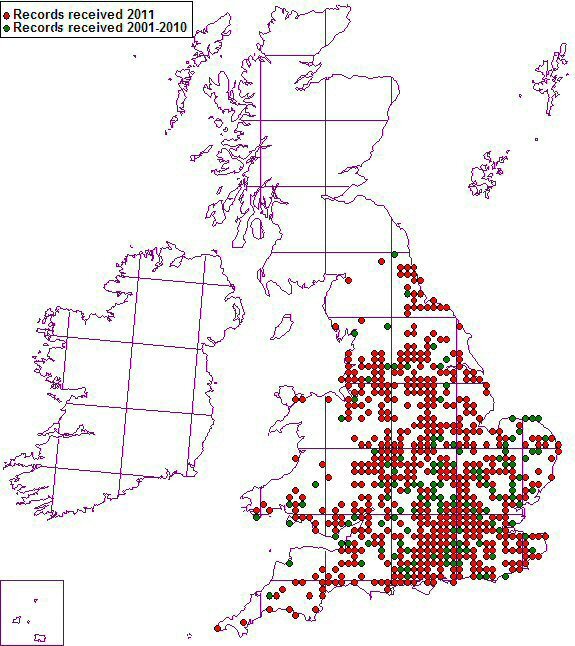 The response of the BWARS membership, local Recording Schemes, our collaborators at the Bumblebee Conservation Trust, colleagues at FERA, The Bat Conservation Trust, The Mammal Society, BTO and RSPB members and the many visitors to iSpot, Wild About Britain, and various wildlife blogs has been wonderful, and show graphically what can be done with well-planned Citizen Science. Evidence shows that after the unusually warm March and April the season was running about three weeks ahead of 2010. Again, the August generation seems to have been quite small, and uncertain in appearance. Stuart Roberts 2011. Back to Survey.